Chiangmaicycling.com is owned by Click and Travel Ltd., a well established Belgian-Thai owned cycling tour company in Chiang Mai which offers bicycle tours and cycling holidays in Chiang Mai and Northern Thailand. The core of the company consists of Belgian Etienne Daniëls and his Thai wife Sripun. The foundations of the company have been under construction since Etienne first moved to Thailand to work for Belgian and Dutch tour companies in 1992. Four years later, Etienne began to rediscover his cycling and mountain biking passion. 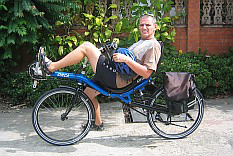 Under impulse of his eco-friendly roots, he decided to set up his own Thai tour company in Chiang Mai specializing in on road soft adventure cycling in Chiang Mai. Click and Travel Ltd. became a registered and recognized Thai tour company early in 2000 and continues to innovate and build on their early successes. Etienne Daniëls was born in Belgium in 1962. Between 1980 and 1989, he was an NCO in the Belgian Para Commando Regiment (Elite Unit). During this time Etienne took 850 parachute jumps, 750 of which were free fall and 450 with a video camera. While in the army, Etienne was also trained in rock climbing and white water rafting. He did 65 flights in a glider of which 2 solo in the early 90's and recently picked up this passion again. He loves to travel to Australia where he can practice gliding to the fullest. After leaving the army, Etienne Daniels worked as a sales representative in Belgium for three years. His first visit to Thailand was in 1981 and in 1992, he moved to live in Thailand where he joined the travel industry as a host and tour leader for "Best Tours". Two years later, he joined "Jet Air World" in the same capacity. Between 1995 and 2000, Etienne worked as a freelance tour leader for local Thai agents of "Kras SterVakanties", "Unitravel" and "Hotelplan". During the nineties, Etienne assured that thousands of people had a good holiday in Thailand. As he was a leader with an unbeatable service record, you can expect the same treatment and service from Click and Travel Ltd. He and his team will be more than happy to prove this. Etienne's wife, known informally as 'Pit', descents from the Northern Thai area of Mae Hong Son. She is co-owner of the tour company in Chiang Mai and has helped to make the company possible. All our cycling guides speak English and have an officially recognized tour guide license from the Tourism Authority of Thailand (TAT). Training our guides is an ongoing internal process and only the very best are selected to join our team full-time. They undergo an extensive training in bike technique, leadership, decision making and first aid. Your guides are also skilled bicycle mechanics and all bicycle maintenance is carried out in-house. We are bicycle enthusiasts who care about our equipment as much as we care about the environment. At Chiangmaicycling.com we use adapted modern mountain bikes, also known as comfort bikes, with 24 gears and front suspension for their versatility and comfort. The bikes come equipped with water bottle carriers. 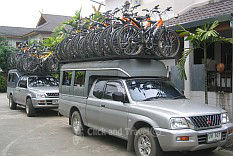 For multi-day tours, racks and panniers (bags) will be provided. The bikes are sized for the individual, so we require prior notification of your approximate height and weight. Frames for both men and women are available. We even have equipment suited for young children, such as trail-gator tow bars, trailer bikes, a bicycle trailer, children's bike seats and children's mountain bikes with front suspension and 21 gears. Two tandems are available as well. Helmets are provided free of charge. Back-up is provided when necessary, but in general we try to avoid the use of a support vehicle. As the company is Chiang Mai based, we have extensive local knowledge and support facilities. However, our longer multi-day tours will be accompanied by a support vehicle which will also serve as a luggage carrier. Click and Travel Ltd. is an inbound-outbound Thai tour company registered with the Tourism Authority of Thailand under the license number 21-0128. We are a family run and family orientated tour company in Chiang Mai and we welcome all people of all ages for bicycle tours and cycling holidays in Chiang Mai and northern Thailand.